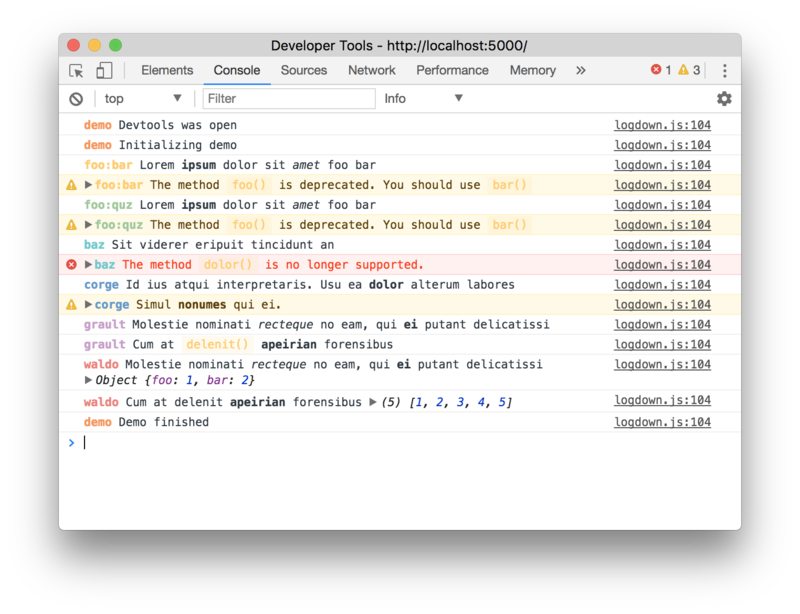 logdown is a debug utility for the browser and the server with Markdown support, providing a single interface and a similar behavior between the browser and the server. It doesn't have any dependencies for the browser version and it's only 2K gzipped. You can see it in action in the example page or in the preview below. Out-of-the box colors work well on both light and dark themes. logdown exports a function. For the simplest use case, pass the name of your module and it will return a decorated console. Just like debug.js and node core's debuglog, the enviroment variable NODE_DEBUG is used to decide which module will print debug information. Multiple comma-separated logger names and wildcards can be specified as well. After creating your object, you can use the regular log, warn, info and error methods as we have on console, but now with Markdown support. 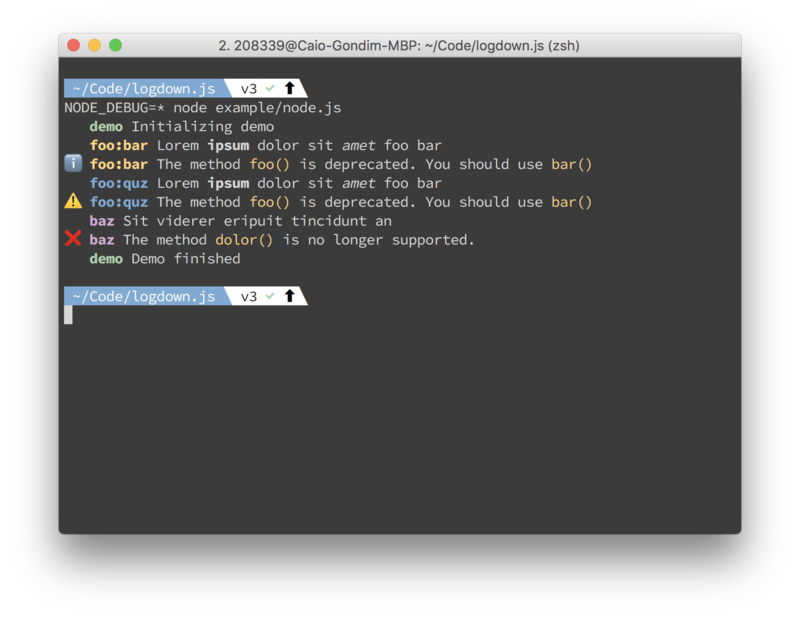 If a method is not provided by logdown, it will just delegate to the original console object or opts.logger if passed. As the native APIs, multiple arguments are supported. The following options can be used for configuration. If setted to false, markdown will not be parsed. default: next value after last used on the logdown.prefixColors array. Hex value for a custom color. Custom logger. On Node it's possible to instantiate a new console setting it's output to a different stream other than stdout and stderr. default: default value is derived from localStorage.debug on browser and from env var NODE_DEBUG on node. Used to enable/disable a given instance at runtime. 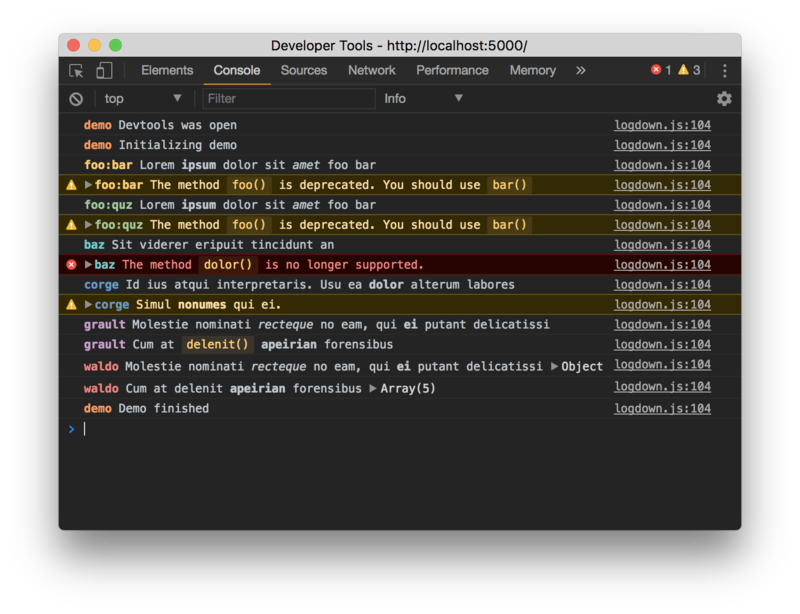 logdown is compatible with Node.js util.debuglog and debug.js as it uses the NODE_DEBUG enviroment variable to control which instances are enabled to output debug info. For the browser use localStorage.debug. Use - to do a negation. logdown.transports is simply an array of functions. You can modify it at runtime in any way you like. Please note, that transport functions will be called even if the logger.state.isEnabled === false. You must decide inside your transport function whether you want to consider the global isEnabled state. If you're using this in one or more of your libraries, you should use the name of your library so that developers may toggle debugging as desired without guessing names. If you have more than one debuggers you should prefix them with your library name and use ":" to separate features. For example "bodyParser" from Connect would then be "connect:bodyParser". If you found this library useful and are willing to donate, transfer some bitcoins to 1BqqKiZA8Tq43CdukdBEwCdDD42jxuX9UY.